Driving to work by Vancouver residents east living of Dunsmuir is down by 16% since 2006! According to the 2011 Census results, the number of people driving to work in the area bounded by Main, 1st Avenue, Boundary and Burrard inlet went from 13,915 to 11,685, an decrease of 2,230. The driving mode share dropped from 57% to 48.7%. For comparison, overall in the City of Vancouver, commuting by driving fell from 51% to 48%. While the total number of commuters decreased by 435, as detailed in Cycling to Work East of Dunsmuir Up 40%, a significant portion of this decrease in driving is likely due to 530 more people cycling to work. This decrease in driving reduces congestion and improves the safety of everybody walking, driving and cycling around the City. Yet another example of the Vancouver’s polices of encouraging cycling, walking and public transit improving the quality of life in the city. More evidence supporting faster implementation of all ages cycling improvements and the removal of the Viaducts. The City of Vancouver’s proposed Point Grey Cornwall Greenway improvements for Point Grey Road from Balsam to Jericho Beach will be much safer for everyone including drivers, cyclists, pedestrians, children and residents. Although it is popular with some, on-street parking is dangerous especially for children. Removing parking, as proposed for some sections of Point Grey, can reduce all collisions by around 25%. By providing safe space for people of all ages to ride bicycles, the planned improvements will reduce conflicts between people cycling, walking and driving making Point Grey safer, more enjoyable and less stressful for all. Those who will likely benefit the most from the safety improvements are the residents along Point Grey, some of whom are opposing the plans. They will no longer have parked vehicles blocking their view of speeding traffic when they are pulling out of their driveways. When they are walking, there will be less risk of being run over by some else entering a driveway who didn’t see them walking on the sidewalk because of a parked van, SUV or truck. According to the proposal, Point Grey between Trafalgar and Macdonald would be reduced to one lane in each direction. This will reduce speeding aggressive driving such as passing on the right and other lane changes. Around 4% of motor vehicle crashes occur during lane changes and merges. The road will be safer for people driving, walking, cycling and exiting their driveways. Sidewalk cycling is not safe for pedestrians or cyclists. It is one of the main concerns of pedestrians and transit users along Cornwall and Point Grey and is not allowed under the Motor Vehicle Act. The sidewalks are way too narrow for cyclists and pedestrians to safely share. That said, it is hard to fault people with children for not wanting to cycle on the road with the speeding traffic. 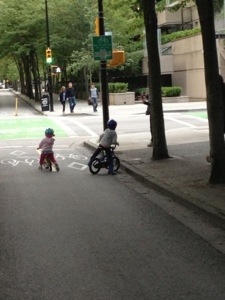 Sidewalk cycling has decreased by 80% on Hornby since the opening of the separated bike lanes. A similar decrease should occur along Point Grey as well. The proposed Pt Grey improvements will increase the number of people choosing to walk and cycle instead of driving. Thus, the total vehicle kilometres travelled during a year will decrease resulting in fewer collisions, injuries and fatalities to motorists, cyclists and pedestrians. The Netherlands, for instance, annually has 5.6 fatalities per billion kilometres while Canada has 8.2 fatalities per billion kilometres, 1.6 times the rate. However, the chanced of dying in a motor vehicle crash in the Netherlands are significantly less with 3.9 fatalities per 100,000 people verses 9.2 per 100,000 people in Canada, 2.6 times the rate. The difference is obviously the people in the Netherlands drive less. As a result of the Dunsmuir separated bike lanes and other improvements, cycling to work is up by 40% in areas east of Dunsmuir in Vancouver. An addition 530 people are cycling to work in this part of the city. This does not include people cycling for other reasons. The increases will likely be similar for Kits and Point Grey as Pt Grey Rd and Cornwall are the missing links in the all ages and abilities cycling network connecting residents to places of work downtown. The Point Grey Cornwall Greenway will also be very popular in the summer with many people using it to get the beaches, parks and events like the Folk Festival, again reducing the amount of driving during the times when there is the most traffic congestion on Pt Grey and Cornwall. 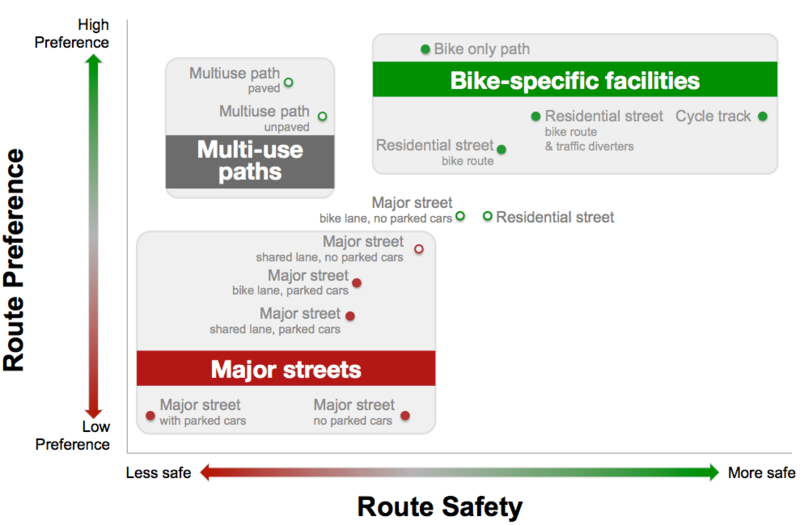 As shown in the chart below from Bicyclists’ Injuries and the Cycling Environment study, separated bike lanes (cycle tracks) and residential streets with traffic diverters calmed streets as proposed for Point Grey have been proven in Vancouver and other cities to be safer people cycling. These facilities are also likely to attract more people of all ages and abilities to cycling. Bicyclists’ Injuries and the Cycling Environment study. M A Harris et al. While it is fine to state how safe a type of cycling facility is, it is important to evaluate it along a proposed route to determine if it will be a safe option. Around 50% of cycling crashes occur at intersections, so routes that have few busy intersections will be safer. Point Grey has very few intersections that cyclists will have to cross so it should prove to be pretty safe. Driveways can also be a problem for cyclists but it is important to note that residential driveways do not generate much traffic so the risk is much less than even low volume intersections. A single family house generates around 10 trips per day. There are 14 driveways accessing 15 houses on Pt Grey from Balsam to Trafalgar. This would generate around 150 trips per day. There is one townhouse with a driveway. Townhouses generate around 6 trips per day so the 8 units would generate around 48 trips a day. From Trafalgar to just passed Macdonald, there are 10 driveways serving 13 houses generating around 100 trips per day. So the total from Balsam to Macdonald would be almost 300. This is far less traffic than most residential streets and the parkades downtown accessed from Hornby generate. Given that these residential street intersections in Vancouver and driveways across Hornby cause few collisions, these driveways along Point Grey should prove to be a low risk to cyclists. An opponent of the Point Grey Cornwall Greenway has claimed that that separated bike lanes are more dangerous based on ICBC collision data. However, what is not mentioned is that the majority of these collisions are at the intersection of Burrard and Pacific. Upon examining collisions in ICBC’s map, it becomes clear that the Hornby and Dunsmuir separated bike lanes are rather safe compared to other routes like Burrard Street. Hornby performs better than Dunsmuir perhaps because busy right turns across it are signalized. Both appear to be as safe or safer than many of the residential street bikeways around the city. 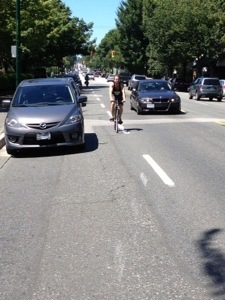 Even the comparison between the separated bike lanes downtown and Point Grey is not really valid. The separated bike lanes downtown have hundreds of thousands of vehicles crossing them per day and even then, the crash rates are not that large. As detailed above, Point Grey will only have a few hundred per day crossing the section between Balsam and Macdonald so the risk due to intersections (there are none) and driveways is much much less. For the section of Point Grey between Macdonald and Alma, the Portside Greenway along Wall St is a good comparison should option 2a, diverting the traffic off Point Grey, be chosen. Wall is along the waterfront so it has no streets crossing it. It also has houses on the north side with driveways. The driveways likely have more vehicles accessing them as there are a few apartment buildings on Wall. Wall Street no cycling collisions reported from 2008 through 2012 perhaps the only bicycle route in the City to hold that distinction. This bodes well for the safety of this section of Point Grey. The current Seaside Route along 3rd Avenue is less than ideal. It is narrow with parked cars on both sides creating a risk of dooring. There is little room for cyclists to get by on-coming vehicles making riding more stressful and less comfortable. Cyclists also have to cross busy Macdonald and Alma Streets. The access to 3rd Ave from the east is hilly, indirect and not obvious so people are less likely to chose it or even find it at all. The current Seaside route from Trafalgar to Jericho has cyclists crossing 18 intersections. The proposed route on Pt Grey will have cyclists crossing only one intersection, Alma. As around 50% of cycling collisions occur at intersections, Pt Grey will be a safer option. From Macdonald to Jericho during 2007-2011 according to ICBC stats compiled by the city, there were two cycling collisions on Pt Grey Rd and four on 3rd Ave. So, even with the higher levels of automobile traffic, Pt Grey had fewer collisions. 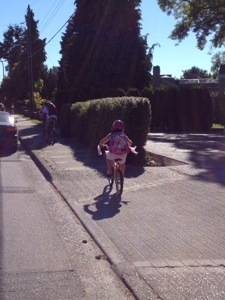 With the planned traffic diversion, traffic calming measures and separated bike lanes from Alma west, Pt Grey should be pretty safe for people of all ages to cycle on. Some people have suggested using 1st Avenue as the bicycle route west of Balaclava with a path on the south side of Pt Grey between Macdonald and Balaclava leaving Pt Grey still open to high levels of speeding traffic. This proposal has many of the problems that 3rd currently has. 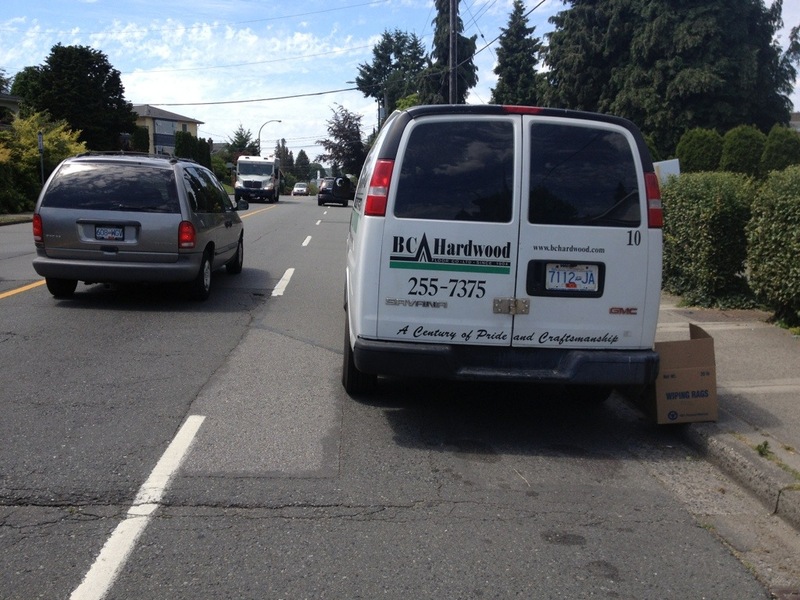 Cyclists would have to cross busy Pt Grey at Macdonald then cross busy Alma and then cross Pt Grey again at Wallace. Cyclists would have to face 10 intersections on 1st instead of only one on Pt Grey dramatically increasing the risk of injury. 1st is hillier than Pt Grey and is much less scenic making it a route that cyclists are not very likely to chose. While 1st looks like a direct route on the map, the hill and all the intersections would make it a slower, less efficient and more dangerous route than Pt Grey. Research has found cycling downhill to be more dangerous than cycling on flatter routes. Pt Grey is a much flatter route than any other options including the current Seaside route on Trafalgar, York, Stephens and 3rd. Invisibility Pedestrians can be difficult to see: They are small compared to a car, and can be hidden by one. At night the problem is more severe. A parked car is the most commonly cited source of obstruction. Parked cars are a traffic hazard for pedestrians, particularly children. Research has shown that prohibiting on-street parking improves safety. The number of accidents is reduced by about 25% in streets where on-street parking is prohibited. Pedestrian crashes often occur when people are trying to cross the street on links outside pedestrian crossings or where no pedestrian crossings exist. One of the causes is the driver’s difficulty in perceiving pedestrians because of darkness and/or parked cars. In the United Kingdom, nearly 90% of the injuries to older pedestrians which are caused by motor vehicles happen under such conditions. In over 10% of cases, the driver cannot see pedestrians because of parked cars. Vehicle speeds were slower in the presence of occupied on-street parking bays compared to the other two environments; however, the speed reduction was insufficient to compensate for observed impairments in drivers’ hazard perception and slower response to the pedestrian in this condition. On-street parking is dangerous for people cycling due to dooring, conflicts with automobiles pulling in or out of parking and reduced visibility of vehicles pulling out of driveways. All three of these problems exist on Point Grey Road. 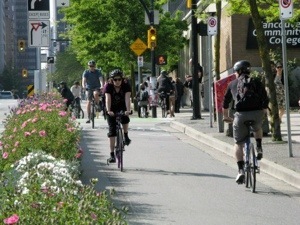 It concluded that the greatest risk to cyclists is when they share major streets with parked cars, with no bike lanes present — such as on Broadway in Vancouver — and that without a designated space on the road, cyclists face a greater risk of injury from moving cars and car doors opening. In contrast, the study concluded, roads with infrastructure designed for cyclists — including bike lanes on major streets without parked cars, residential street bike routes, and off-street bike paths — carry about half the risk, while physically separated bike lanes carry about one-tenth the risk. Teschke noted that while accidents involving parked car doors — “doorings” — were on the greatest route risk for cyclists, such accidents are responsible for 10 per cent of all accidents involving cyclists. Cyclist in Door Lane. Would Driver Have Time to React? 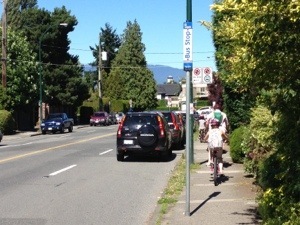 Almost all people cycling along Point Grey are riding in the “door zone”, too close to the parked cars to avoid being hit by a door. This is especially dangerous on downhill sections where cyclist and motor vehicle speeds are higher and breaking distances are longer. Doorings have proven tragic in Vancouver, In 2001, 40 year-old actor Keith Provost was killed riding his bicycle as a result a driver opening a car door in front of him. Being forced to suddenly brake or swerve to avoid hitting a fallen cyclist is dangerous for motorists as well. In an attempt to avoid hitting the woman cyclist who fell off the Stanley Park Causeway, the bus skid from the curb lane to the centre lane. It is fortunately a collision with another vehicle did not occur. 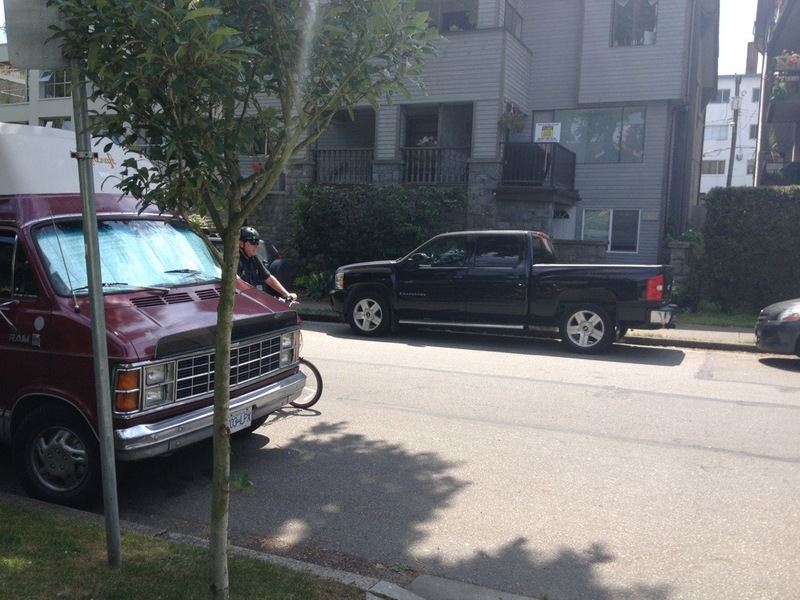 Currently, parking is allowed too close to driveways along Pt Grey often totally blocking the visibility of cyclists and drivers exiting their driveway. The removal of the parking proposed in the City’s plans will eliminate this problem and make Pt Grey safer for everyone. The sight distances along Pt Grey are far less than recommended by the provincial government. 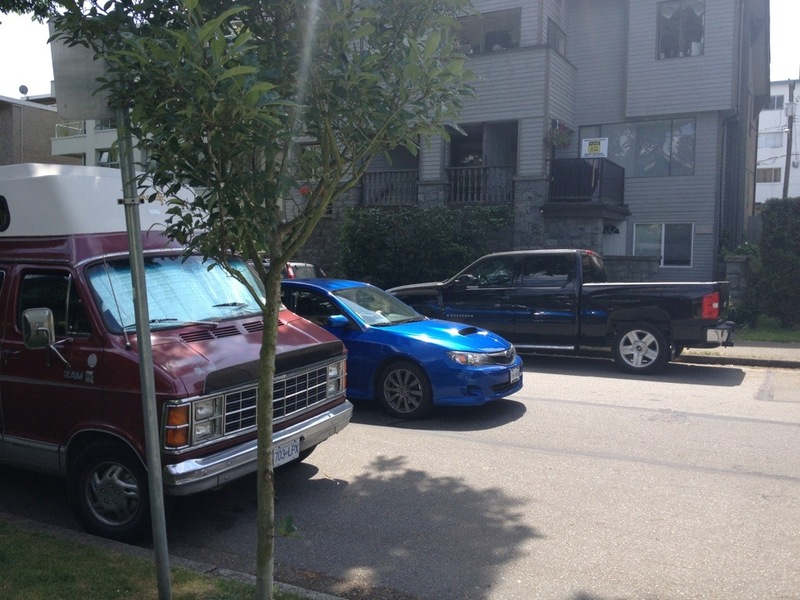 Current practices permit the longitudinal placement of on-street parking too close to driveways. Roads with bike lanes should exclude on-street parking when speeds exceed 30 mph (50 kph) so as to provide adequate sight distance without creating sporadic on- street parking spacing. Roads that do not have bike lanes present should exclude on-street parking when speeds exceed 25 mph (40 kph). So, please encourage the City of Vancouver to build the Point Grey Cornwall Greenway now and speed up the implementation of other badly needed cycling improvements. Lets realize the safety, health, environmental, social and economic benefits of cycling as soon as possible! Tell them the problems that you have experienced along Point Grey & Cornwall and let them know what the Point Grey Cornwall Greenway would mean to you, your family and community. Traffic can be intense. There are plenty of things happening on our streets that are dangerous, rude and frustrating. Mostly it is a few bad apples but even the best of us have a bad moment every once and a while. Cyclists can be quite self righteous at times. I’m certainly guilt as charged. We all know of the challenges created by automobile overuse and are often not shy to remind others. If a person in a car breaks a rule that places me at risk, I certainly will let them know. I have a loud voice and can use it to a good effect. For some unknown reason, however, what really seems to piss off quite a few two-wheelers is drivers who stop for them when they are not required to. Hard to say why they are stopping. Maybe they think the same rules apply to pedestrians apply to cyclists. If they took their test years ago, they may not have had any questions on cyclists. Maybe they didn’t think you were going to stop. Bicycles can stop quickly. It is often hard to tell the difference between a cyclist who is going to stop and one who is not. Maybe it is a busy road that is really hard to cross. I’ve been glad a few times when drivers have stopped for me on such a road. Also, don’t forget that the driver is a metre or two behind the front of the car. They may not be sure that they arrived first at a four-way stop. Whatever the reason, cautious behaviour is typically safer. If anyone is not sure that someone in a car or on a bike is going to stop, it is best to slowdown or stop. A stopped car is much safer than a moving one. Other drivers should always be prepared for the vehicle in front of them to stop anyway by following at a safe distance and speed. Now there is the problem of one drivers stopping and drivers in other lanes not stopping. In this case, it is your responsibility if you are cycling or walking to make sure that vehicles have stopped before you pass in front of them. Don’t blame the cautious driver for the reckless actions of others. With all the bad road behaviour that has been proven to cost lives, injury people and damage property, why waste any time worrying about someone being nice even if they are not following the rules exactly. Unless you can prove that this a big problem or even a minor risk to anyone, there is no point in doing anything about it. It would only take resources away from the enforcement of laws that matter or educating drivers and cyclists on other, more important issues. The bottom line is that getting angry at people that are just being nice makes cyclists look like jerks. It is rather sad that we live traffic-filled lives where courtesy is treated like a crime. My advice. Nod thanks or wave nicely at them, make sure the coast is clear and be on your way. Be happy that there is at least one cautious, courteous person that has crossed your path today.